SCARCELY had the change been accomplished when the long-gathering clouds of war broke over Europe. At this critical time in early September, 1939, the shrewd and forceful Edgar Holladay was a sick man. His elder son Henry was on holiday, and the younger, Alec, who was due home from a Territorial camp, did not return from there but was drafted straight into war service. Though he began his active service as a private, he attained the rank of major before its completion. On returning from his holiday, Henry found that his would be the heavy charge of carrying on the whole business practically single-handed, and this he actually did until his brother was demobilised in 1946 and could take a share of the task. During the trade depression that followed the outbreak of war, part of the Company's new premises was requisitioned. The reaction soon came, however, when orders poured in from all quarters. Business was something of a nightmare in a city smashed by "Baedeker "raids (-"This Exeter was a jewel : I have destroyed it "-). Though the works sustained some damage, production never stopped ; in fact, the hospitality of the Golden Hammer was extended to another firm of Exeter founders, Messrs. F. I,. 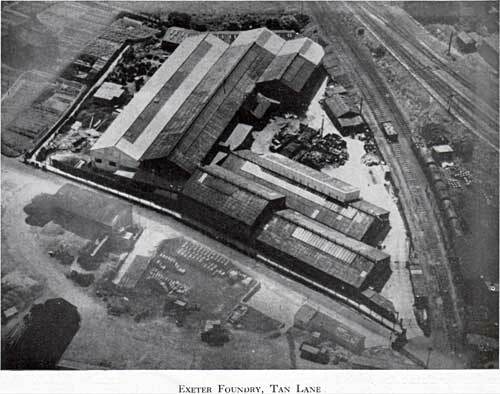 Parkin & Sons, Ltd., whose foundry in Bonhay Road had been completely destroyed. A working arrangement was made whereby employees of Messrs. Parkin could continue working for their own firm under the Hammer. Help was also afforded to another bombed-out trader by letting him a part of the Queen Street showroom premises. After years of poor health, Edgar Holladay died on January 2nd, 1943, at the age of 75. He had served the Golden Hammer with zeal and business acumen worthy of the best of his predecessors, and, like them, had crowned his career with an enviable reputation for straightforwardness. The Company's history then repeated itself in the election to the Board of a director's widow. Mrs. Beatrice Holladay, nee Eland, whom Edgar had married in 1907, was the younger daughter of Henry Septimus Eland, a well-known Exeter bookseller. Mr. Eland's other daughter, Margaret, had married Edgar's brother Hugo. The latter remained in office as Chairman, but through advanced age he no longer took an active part in the Company's affairs. He lived long enough to see the de-requisitioning of the Company's premises, and the incorporation of Taylor and Bodley (Exeter) Ltd., of Commercial Road. One of Garton & King's directors, Henry Holladay, had been on the board of Taylor & Bodley's since 1937, but now the former company took over entirely. Shortly afterwards, Hugo died at the age of 84, on August 8th, 1946, a few days after his wife. Like his brother, he can he recorded as an honest and industrious upholder of the Golden Hammer.